We have all kinds of photo filtering and photo enhancement apps on our iPads. One that is used by (shall we call them) the ‘serious’ group, is Filterstorm. A universal app that is more about slicing and dicing multiple images together for a whole new effect. 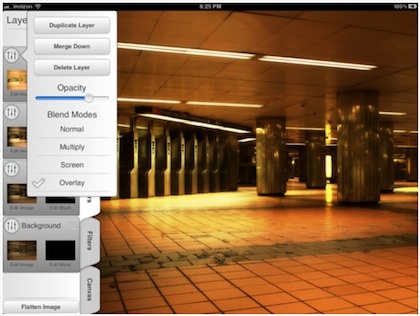 Filterstorm has all the normal tools you would expect for a photo enhancement tool on the iPad, with the addition of 5 levels of layers (adding a sixth, merges the lower two). And, Double Exposures which can be scaled, positioned and blended! In the latest update, text added to an image can also be rotated. Like we said, Filterstorm has all the blur, sharpen, cropping, filters, etc… that you would expect so it is a great general iPad Photo tool. While offering extras that the pros will use and the rest of us will play with and be amazed those are our pictures.